Don't settle for low quality mass productions doors from big box retailers that are destined for a landfill. Own a custom entrance that will become a cherished family heirloom, and appreciable work of fine art. At ArtFactory.com we believe in building furniture and doors that are not something that you just use for a few years and then throw away. Building items that are disposable is a practice that is unique to the past fifty years. In the old world, when a piece of furniture was built, it was built from solid, natural materials by master craftsmen. Most importantly, it was built to last forever. Something like a solid wood entrance door would be passed down through a family for generations along with the home that was also built to last forever. With this handmade craftsman door, handcrafted from solid cedar (as shown), we have carried that tradition of built to last craftsmanship into the 21st century. The custom sidelight windows can be customized in any style or size so that they will allow in just the right amount of light. We have built these in the same hand and craft that would have been used during that era. A true modern masterpiece inspired by historic design, and built with period correct methods and materials. This type of product cannot be built overnight, or with low quality materials. That is why we use the highest quality, full length solid timber, and build it by hand, using the age old, tried and tested method of mortise and tenon joinery. This makes for a product that will stand the test of time. It is our belief that when you buy a solid wood doorfrom ArtFactory.com, that is will be the last door you ever have to buy for that entrance. Not only that, but this door is an investment that will add to the long term value of your property. The handmade craftsman door as pictured features our popular twisted S iron door pull (HH253). You can from choose this, or any of our hundreds of style of custom door handles and theme door pulls. Your options are limited only by your imagination at ArtFactory.com. The custom handmade craftsman door, as pictured, features our popular twisted S iron door pull. We offer wrought iron door pulls customized in any size or style that you choose. Choose from our hundreds of styles of custom door handles or theme door pulls, or have our designers create one for you. We make custom door hardware in any size, style or design, and to fit any application. These custom hardware products are hand hammered into shape by master blacksmiths over a coal fired forge. Blacksmith hand forged wrought iron makes for hardware the will stand the test of time. As with all of our custom doors, your hardware options are fully customizable. This customer chose to add just wrought iron clavos as an accent element to complete the traditional feel of this Arts and Crafts movement inspired door design. Additionally, all of our hardware comes advance patinated with a hand applied, heat infused iron oxide patina. This type of finish won't crack, peel, or flake like paints and powder coats. Our door hardware is built to your specifications by our master blacksmiths using hand forged wrought iron. When we say hand forged, we mean with fire, hammer, and anvil. We never cast, drop forge, or use any fast or mass production process. This means you will receive a fine art quality piece of hardware that is uniquely yours, of investment quality, and built to stand the test of time. This includes our hand applied, iron oxide patina finishes. These finishes are bonded to the metal at over 1000 degrees Fahrenheit so that the finish becomes part of the metal, and will stand the test of time with little or no maintenance. Our solid wood products are never built with particle board, veneers, or laminates because fine art is never made with cheap, poor quality materials. We specialize in building historically inspired designs that are built using the same techniques and materials as the originals from history. Building a family legacy through inherited heirlooms has been going on since the beginning of time. Building heirloom furniture and doors intended to last forever is one of the primary ways we all have in achieving some small part of immortality. These cherished family items will touch our loved ones for many years to come through physical interactions as well as family photos. Many societies, including the Egyptians and Mayans, as well as European royalty and aristocracy have created a passed down legacy and heritage in this way for thousands of years. In fact, if it were not for these artifacts, it would be impossible to know these people ever existed, how they were important to history. This is also the case in the 21st century within your own family. No matter if it’s a simple, hope chest with your personal message or name as a gift to a loved one, or an extravagant, fine art quality, master handcrafted custom handmade craftsman door, these items will be important to the story of your family history long after we are gone. All of our handmade, solid wood entrance doors are built using the age old technique of hand hewn, mortise and tenon joined construction. This type of craftsmanship makes for a door that is built to stand the test of time. 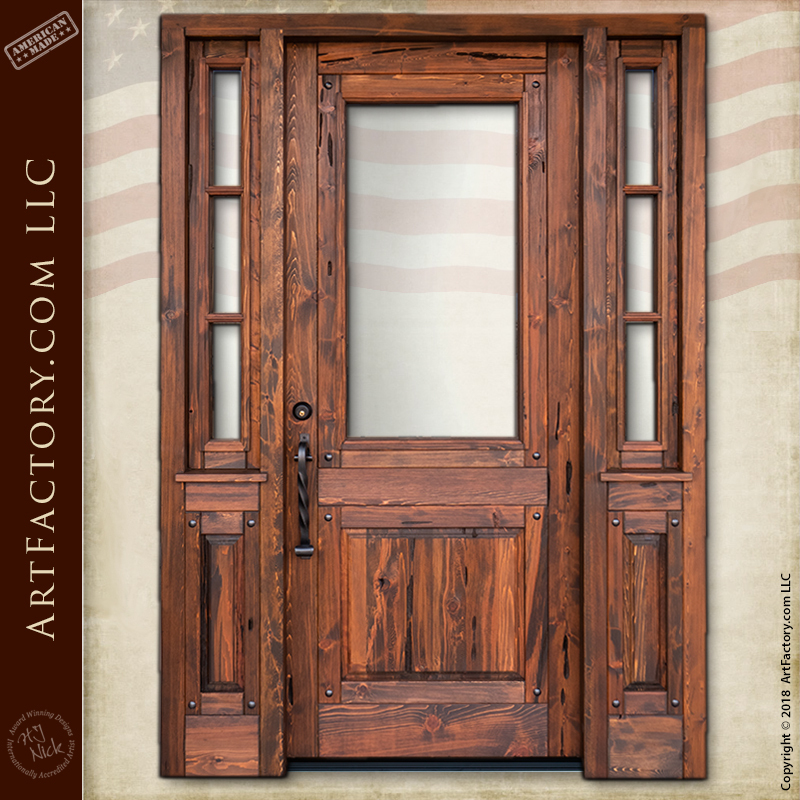 This is an exquisitely designed, fine art quality, genuine solid wood, handmade craftsman door. Our combination of the finest all natural materials, and master hand craftsmanship allow for us to offer a quality of product that is unsurpassed anywhere else, at any price. These are not only investment quality doors, they are an appreciable asset that will add to your financial net worth. In the eyes of your family, they will become a cherished artifact, and a priceless piece of immortality that will be tangible for generations. It will serve as a way to celebrate your life, and its direct effects on who they are and what your influence was on your family's history. True artifacts enhance and enrich all of our lives in a way that mass-produced merchandise never will, thus preserving the best of mankind and expressing our love for each other. This unique, handmade craftsman door is the work of our world class design department, and in house senior engineers. All of our products are designed, and built under the direction of award winning artist H.J. Nick. Every product is signed and certified as world class fine art quality by H.J. Nick, before it leaves our state of the art facility. This type of certification ensures that your product has appreciable value in antiquity as fine art. Don't settle for low quality, hollow or faux wood mass production doors that will need to be replaced every few years, when you can own a genuine, heirloom quality product. All custom doors from ArtFactory.com are designed by, built under the supervision of, and signed by award winning artist H.J. Nick. This signature stands as certification that your products has been found to meet all world class fine art criteria. Our in-house master wood workers, and blacksmiths handcraft all custom furniture and doors to your design specifications. We only use the highest quality materials. All of our wooden furnishings, doors, and gates are made from solid, full length, naturally air dried timber, and handmade in the USA, in our Scottsdale, Arizona factory. We believe in the quality of our products in craftsmanship so much that this custom door, and all of our products are guaranteed forever. Call for a pricing on our handmade craftsman door, or any of our other fine art quality custom entrance doors at 1-800-292-0008.